Last weekend's Jumbo Gumbo Cookoff arrived just in time with perfect sunny weather after a couple of dreary, chilly, soaking wet days. I had been looking forward to the event for weeks, since I had been invited to be a part of the Foodie Fan Club. I, along with fellow food blogger friends Michael Roberts of Arkansas Foodies and Kevin Shalin of The Mighty Rib had the great honor of handing out our own Silver Spork awards to the team we deemed the best gumbo based on no mathematical equation whatsoever. The table you see here where I perched my schwag for the picture op actually belonged to the chef judges who sat and tasted the top 12 gumbos, scored them by several categories and contributed to the systematically tabulated final calculation to determine the top 3 best gumbos in the competition. When I looked over chef judge Todd Gold's shoulder at his scorecard, I saw a bunch of numbers in rows and columns which gave nothing away. 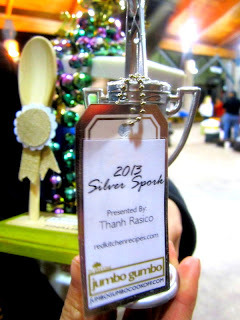 There's my Silver Spork award. It felt so special to have my name and claim to fame right there in print to be handed out. I was so happy that Drake's Gumbeaux, the team I gave my award to was equally excited to receive the award. They also received an award for ranking among the top 12 out of over 30 teams at the competition. Outside of Jumbo Gumbo, they also won 1st place last year in the 2012 Duck Gumbo competition in Stuttgart. I just loved the flavor of their gumbo. I have a love for gumbo, and I knew that at the prospect of having so many great choices, I would have to realize which ones I could love and leave from the ONE that I would love and return to for more. Two more of the top 12 contestants shared their awards with me. The LSU team had a fantastic tasting gumbo which she topped with freshly fried okra. I swear my hairstylist Michael at Caracalla just told me he had done the very same thing the last time he made gumbo. The outcome of the crunchy okra in the saucy mix was brilliant! This would be one of the tricks learned from Jumbo Gumbo that I will be trying! The ortho team Brace Yo Self also had a phenomenal presentation for their gumbo topped with vibrant chopped green onions and toasted french bread predunked in the flavorful sauce for your pleasure. If I hadn't still been thinking about Drake's Gumbeaux, I would have seriously thought about handing my Silver Spork award to team Brace Yo Self! There were a lot of great names in attendance by the way! They even said that I was about the fourth person who had been by to take a picture. That says a lot. Maybe half of cooking is making it good looking! They even had hot sauces of your choice to the side, water to offer, and pretty beads. I ldo love a nice ambience when I dine. Again, another eyecatching name. Also positioned perfectly as if to be a street sign along the walkway. My husband was happy to be in town to enjoy the sunny goodness, away from temps of 22 below and frozen eyelashes in Alaska. We had a great time basking in the sun, agreeing to disagree on several of the tastings, and walking around holding hands for date night/gumbo judging. Little Rock's River Market Pavillion is always a fun place for enjoying the outdoors. We've been here often for Farmers Markets, ice skating in the winter, and school field trips. Look at that beautiful blue sky! Kevin and I took a moment to pose with Francis the crawfish. Hey, watch that claw! The event lasted from 5 - 9 pm. It went by pretty quickly to me. Before I knew it, Melissa was up on the stage announcing the top 12, then Mayor Stodola took the stage later to announce the top 3. Contestants also had the opportunity to win by Fan Favorite. The more people stuffed your jars, the more of a chance you have to win. Proceeds went to benefit The Allen School. So now you've had a look at Jumbo Gumbo 2013. Next year, come on out and "Let the good times roll." You can have a quick sampling of each of competing teams' gumbo at their booth, or you can grab a handy muffin tin, fill it with rice, leave one space open for your drink, and walk around with plenty to eat. My advice is to get there sooner than later! Congrats again to the Drake's Gumbeaux team!! We look forward to seeing you at Jumbo Gumbo 2014! Great write-up, Thanh! Did you see how smooth I was with that beer in our pic? It's very well camouflaged!! Ha! And thanks!